It’s been a couple of weeks since anything sweet was baked at our place and with the cold weather approaching we needed a dessert for a cozily cold afternoon at home. 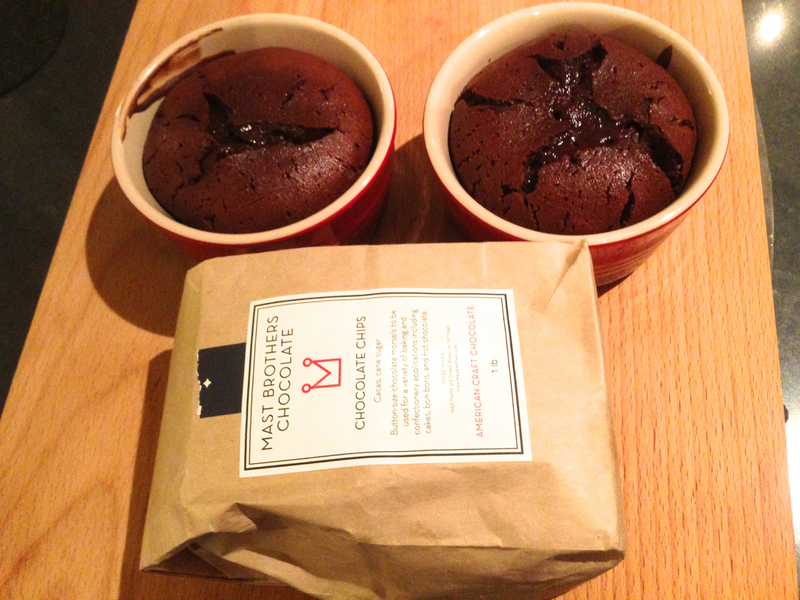 We happened to walk by our local Mast Brothers Chocolate store which inspired us to bake Bills famous soft centered puddings. 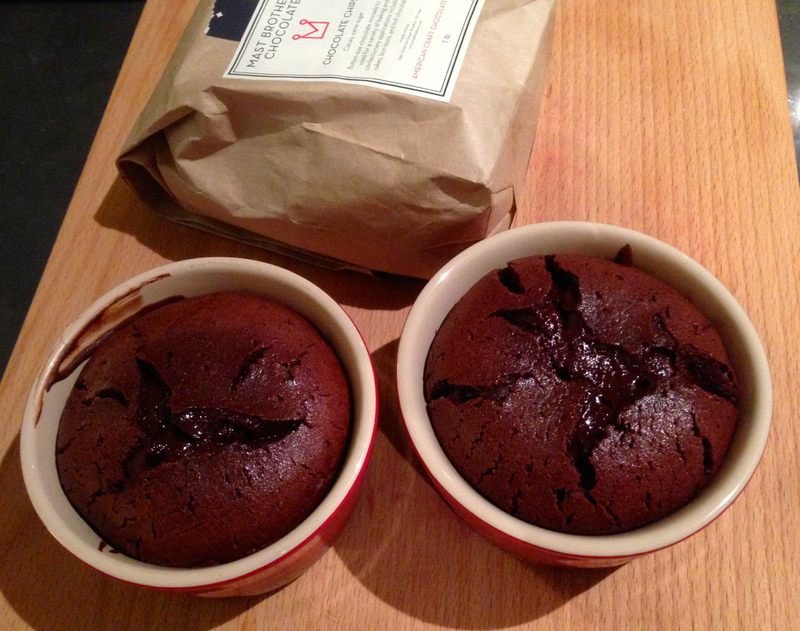 My husband likes to call these chocolate souffles though I’m not sure if they are. What makes a souffle a souffle anyway? The chocolate I used for this recipe is the Mast Brother Chocolate buttons. They sell them at their store in Williamsburg, Brooklyn and they can also be purchased online. But any good quality dark chocolate will do. I’ve used Lindt 80-85% dark chocolate before as well as a bunch of other varieties. High cocoa is key in making this a nice rich dessert. I’ve used the recipe out of the book Bills Open Kitchen for years to create these soft centered puddings. The pudding is cakey, warm but slightly gooey in the middle and the serving size is perfect. You don’t feel sick from eating it but you do feel satisfied and content. This dish is a fantastic dessert, sure to please your guests even though it’s super easy to bake and the batter can be prepared in advance and popped into the oven when you’re ready to go with sweets. The only thing I sometimes change about this recipe is the quantity. I’m often just making it for two. So below, you’ll find the halved recipe of the original with some tips to make halving a little simpler. Bon Apetit! Preheat the oven to 400°F. Place the chocolate and butter in a heatproof bowl over a saucepan of simmering water, making sure the bowl does not touch the water, and stir until just melted. Place the eggs, sugar, and flour in a bowl and mix until just combined. Gradually mix in the chocolate mixture. Pour the mixture into four 1 cup ovenproof ramekins and place on a baking tray. Bake until the edges are set, about 15 minutes. Serve with cream or crème fraîche OR just ice cream. There are lots of rotting apples on the ground. Be prepared to dodge them as you are picking. Luckily our dog didn’t really take much notice of them. Unless you need 10 bags of apples, apple picking is a relatively quick activity. You don’t need to plan to spend more than an hour or two over at the orchard. Maybe bring a packed lunch and have a picnic when you’re done. The shop at fishkill is quite lovely too. It’s always nice to pick up some super fresh produce. It’s such a nice feeling to actually pick the fruit off the tree, appreciate where things come from or how much energy has had to go into growing it. People always talk about stuff like that and I would think “That’s nice” but now I feel like I “get it” just a little more.